Vegas Hotel News: O'Sheas to be Re-named and De-themed? As expected, Clark County zoning officials approved plans for the Caesars Entertainment Project Linq. New renderings of the project have been released that make the project look more upscale than previously thought. In the past, some people have referred to the project as the O'Sheas street O'Shops but in the new drawings it looks like O'Sheas doesn't even exist. At least not in its current form. It appears that O'Sheas will be completely transformed into a modern de-themed casino, similar to say Aria or the M Resort. This could be a good thing, but I'm definitely going to miss the old Irish pub theme of O'Sheas. While it isn't the nicest place in the world you can always count on cheap drinks, cheap games and cheap food at the food court. I'm guessing all of those things will go away with the renovation. It's important to note that I'm just speculating that O'Sheas will be re-named and de-themed. 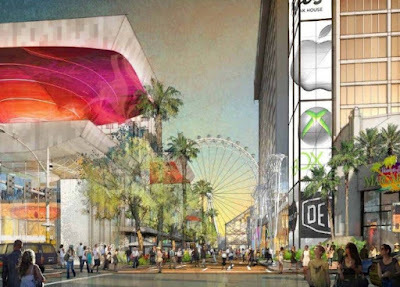 Caesars Entertainment hasn't made this announcement yet, and all of the press I've seen regarding Project Linq still refer to the property as O'Sheas. Also it appears there are a couple of different versions of the new renderings, so the final decision might not have been made yet. Reading between the lines though, it looks like the days might be numbered for the old O'Sheas. 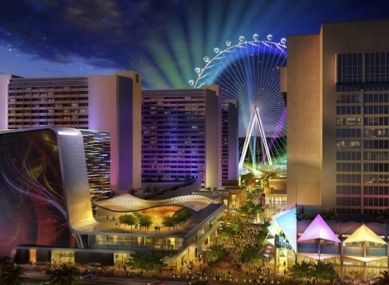 Caesars Entertainment had an official press conference this week to discuss plans for The Linq. As speculated, O'Sheas as we know it is going away. BUT there are plans to "move" the O'Sheas casino and somehow merge it with Imperial Palace. It's kind of hard to envision what that will look like, since Imperial Palace is also getting completely made over and re-named as a result of Project Linq.